One tedious job is to pack lunch for kids, of which the best challenge is to make them an attractive meal both healthy and colorful. Another big challenge which all the moms face is to make them finish their lunch. Here’s one such recipe which is both colorful, nutritious and the best part is that you can make it in less than 15 minutes. 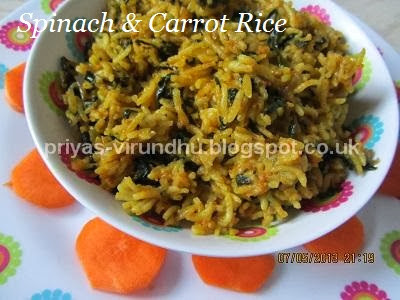 This carrot rice is very simple and can be made with either freshly cooked rice or with left over rice as well. 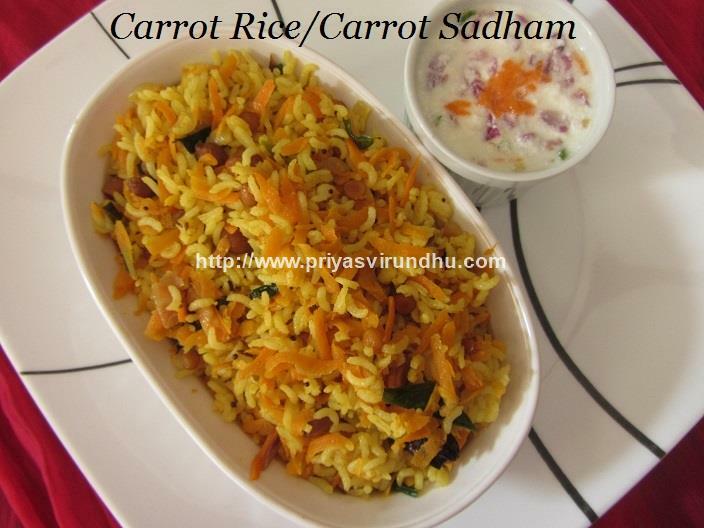 Do try out this healthy Carrot Rice recipe and post your comments here. Meanwhile do check out other interesting Vegetarian Rice Varieties, NonVegetarian Rice varieties here. Are you looking for an aromatic, flavorful, onepot meal, then you have landed in the right place, yes it’s Ghee Rice. Ghee rice can be made in just 15 -20 minutes and serve it dal/paruppu thakkali, peas masala, kurma , chicken curry/non veg gravies, egg masala or any other spicy gravy of your choice. 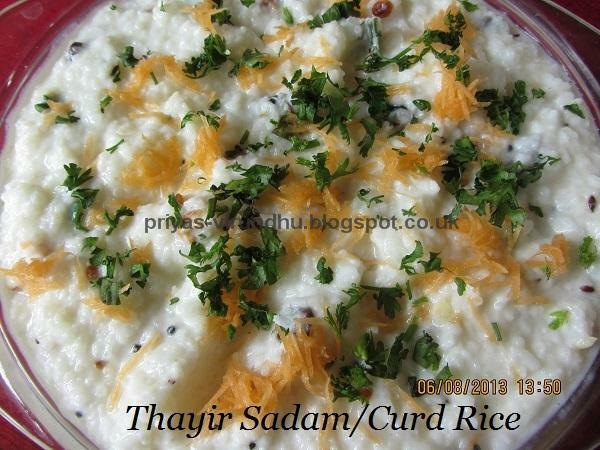 Do try out this delectable, heavenly ghee rice and post your comments here. Meanwhile do check out other interesting Rice varieties, Biryani recipes etc and have a great day. 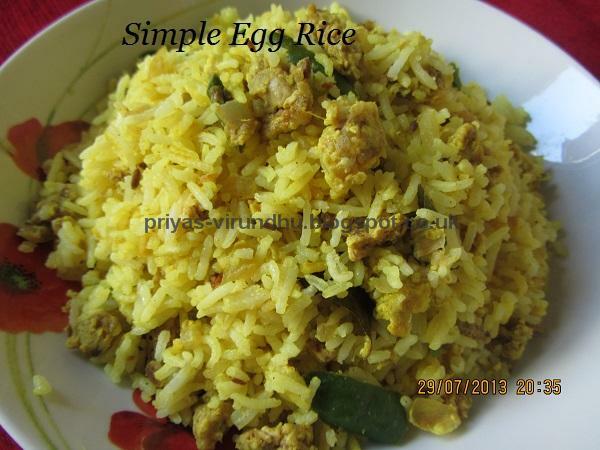 Here’s how to make Ghee Rice with step by step photos…. 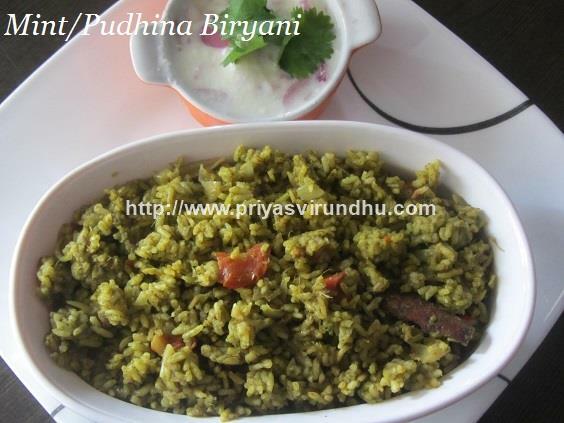 Today, I am going to share a very flavourful, tempting and healthy Mint/Pudhina Biryani. This is a one pot meal that can be made very quickly and perfect lunch box recipe. So without much delay Iam moving on to the recipe, do try it out friends and post your comments here. 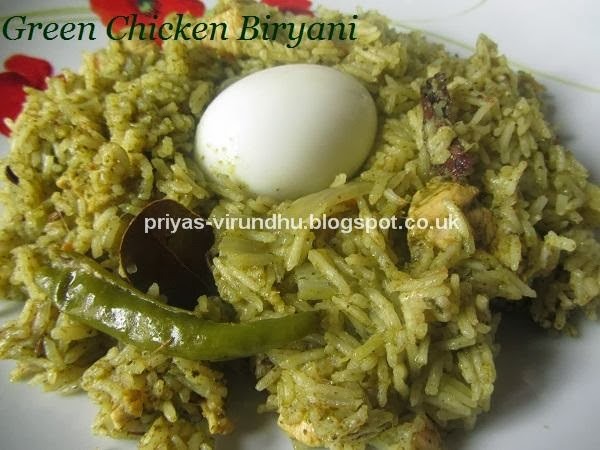 Do check out other interesting VegBiryani/Non-veg Biryani's here and have a great day. Today, I am going to share a very healthy and quick millet recipe –one pot meal in which lentils, millets and vegetables are cooked together and served hot. In this recipe I have added just red chilli powder and coriander powder but you can very well replace it with bisbelabath mix. You can buy the Bisibelabath mix from shop or make it at home, do check out the recipe here. Do try out this easy and healthy recipe and post your comments here. Meanwhile also check out other Millets recipes here. Today, I am going to share a very colorful, vibrant, tasty, flavorful and delicious capsicum/bell pepper/kudaimilagai rice. This rice is a perfect lunch box item for school and office. The rice is perfectly blended with Indian spices along with crunchy and colorful capsicum which makes it taste heavenly. Not just the color, capsicum is loaded with vitamin A and vitamin C. They have low calories and helps in speeding up the metabolism. Capsicum has found to have good effect on gastrointestinal problems like flatulence, stomach upset, abdominal cramps etc [info source:the health site]. I have used all the three colors of capsicum [red, green and yellow]. You can just use whichever is available at home. 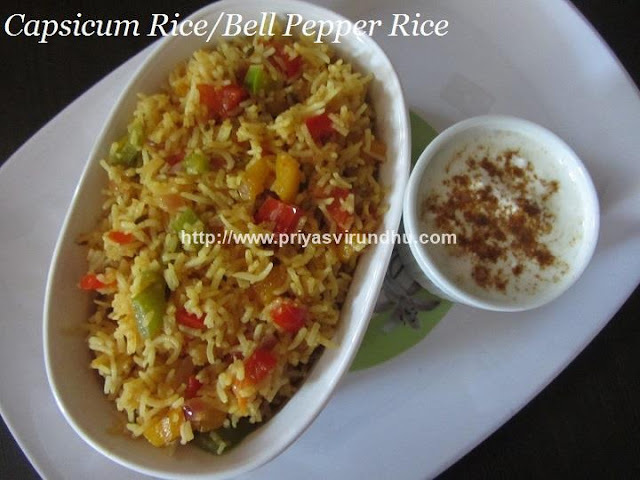 Do try out this delectable capsicum rice and post your comments here. Meanwhile do check out other interesting Vegetarian Rice Varieties and Non Vegetarian RiceVarieties here. 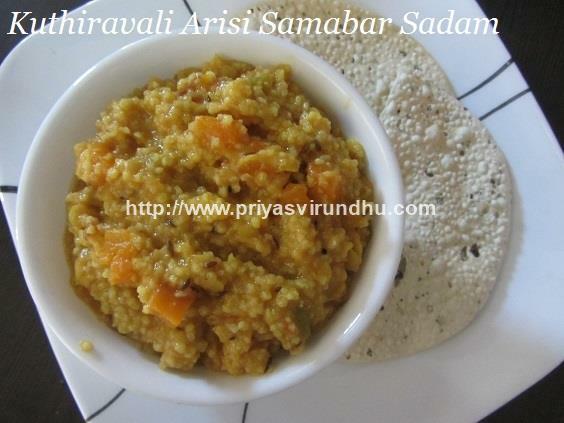 Today, I am going to share a very healthy and filling Saamai Biryani/Little Millet Biryani. Saamai is called as kutki in hindi, sama in telugu, saame in kannada and chama in malayalam. Little millet/saamai is smaller in size when compared to other common millet varieties. It is rich in fibre, helps in reducing fat and is good for bones and muscles. Saamai has lot of iron and has high antioxidant activity. It helps in controlling the blood sugar level and helps in healing diseases related to stomach. I have already blogged about millets in deatail here. Do not forget to check "all about millets" and other interesting millet recipes in the links. Meanwhile do try out this healthy and delicious Saamai Vegetable Biryani and post your comments. Today I am going to share a easy, healthy and quick one pot meal, perfect for lunch box, parties, get-togethers etc. 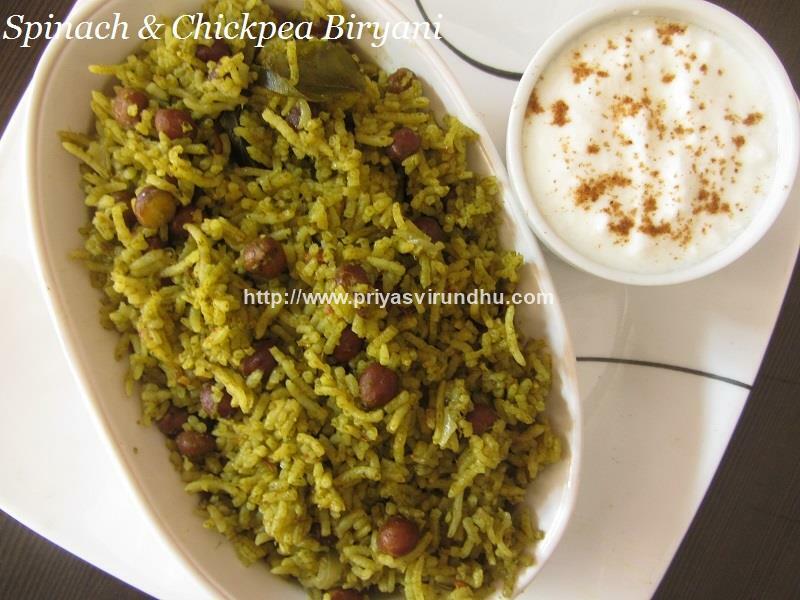 It’s none other than Spinach and Chickpea biryani, this colorful green birynai is very flavorful, super healthy and tempting. Spinach and chickpea is always a wonderful combination, be it salad, soup, curry or rice variety. 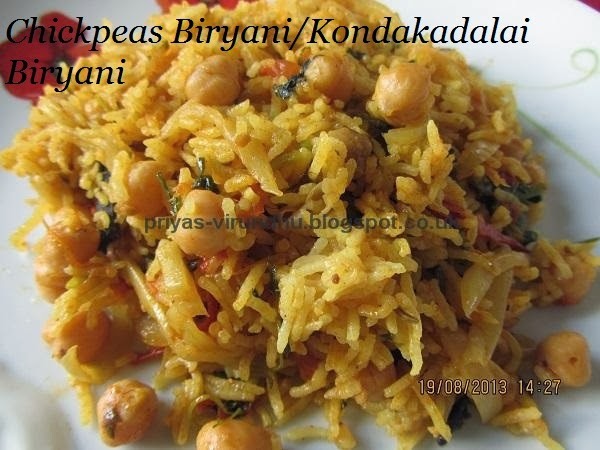 I have already posted chickpea biryanii and spinach & carrot biryani earlier, do check out those biryani’s varieties also. Do try out this healthy Spinach and Chickpea biryani and post your comments here. 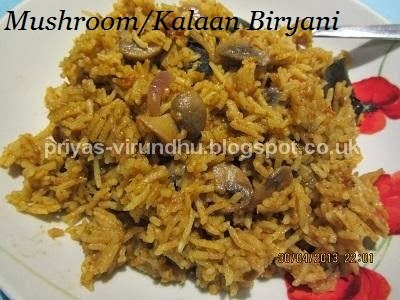 Also check out other interesting Vegetarian Biryani's/Pulav and nonvegetarian Biryani's/Pulavs in the links and enjoy. Puliyodharai is traditional and authentic dish prepared in South India. We can taste excellent and tempting puliyodharai as prasadham in all the Perumal temples in Tamil Nadu. Triplicane Parthasathy temple’s puliyodharai is very special and has unique taste and flavor which is always close to our heart and soul. I just love it to the core. 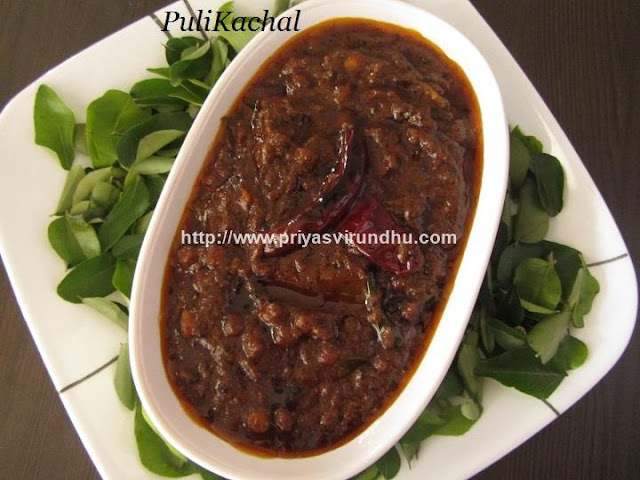 Pulikachal is a paste prepared with tamarind/puli, dal and spices. If we have pulikachal at home, then we can prepare puliyodharai at any time and serve it pappad or appalam. Puliyodharai/Puli sadham is also served during valaikappu with other rice varieties. Do try out this pulikachal and post your comments here. Meanwhile do check out other rice varieties here. 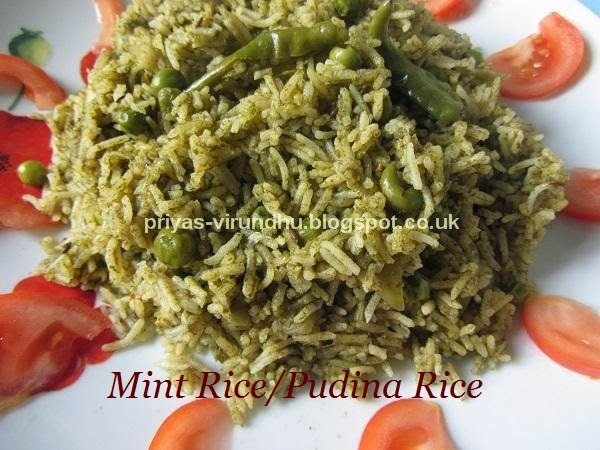 Today I am posting a very simple, healthy and quick lunch box recipe – Mint rice/Pudina rice. Clean the mint leaves the previous night and keep it in the refrigerator and in the morning you can finish off this rice in no time and pack a healthy lunch for your kids, husband or even for yourself. Here’s how to make Pudina Rice/Mint Rice with step by step photos…. Today with not much of an introduction I am going to share with you all a very colourful, flavourful and delicious Green Chicken Biryani. 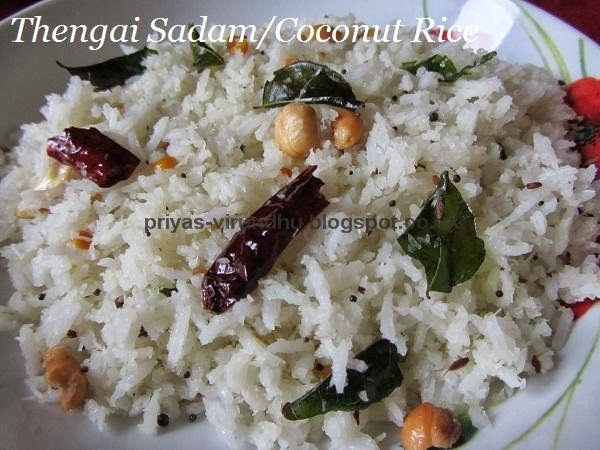 Coconut rice/Thengai sadam is a very popular, common and authentic rice variety of South India. Thengai sadam is a delectable and flavorful rice prepared with freshly grated coconut, along with red and green chillies. Thengai sadam is perfect lunch box item which can be prepared in no time in the morning rush. Not only an lunch box item it is also one of the important rice varieties prepared during Valai kappu (Baby Shower) in South India. I have already posted lemonrice, bisebelabath, curd rice, tomato rice in Valaikappu menu and will be updating with other rice varieties in my future post. We make different kinds of vegetarian biryani, this is yet another biryani with chickpeas, a very healthy and flavourful biryani. Chickpeas are very versatile legumes that have nutty and a buttery taste. When combined with all the masalas and cooked with rice, it makes a perfect protein packed meal for us. This also serves a healthy lunch box recipe. Do try it out guys you will surely love it. 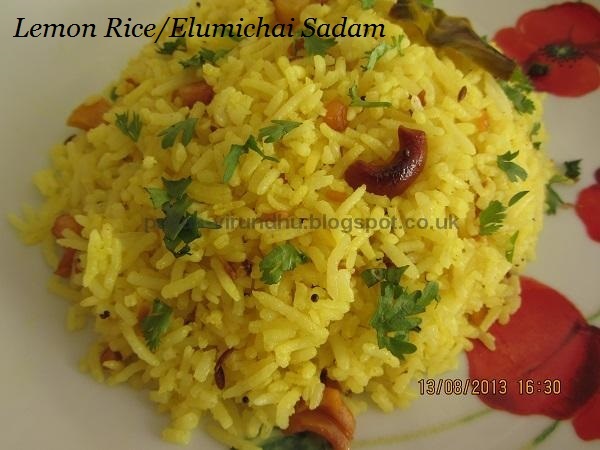 Lemon rice/Elumichai Sadam is a very common, traditional and authentic dish prepared in all most all South Indian homes. This heavenly tasting lemon rice is always paired with Potato Masala/Fry, it is like they are made for each other and is totally unbeatable. 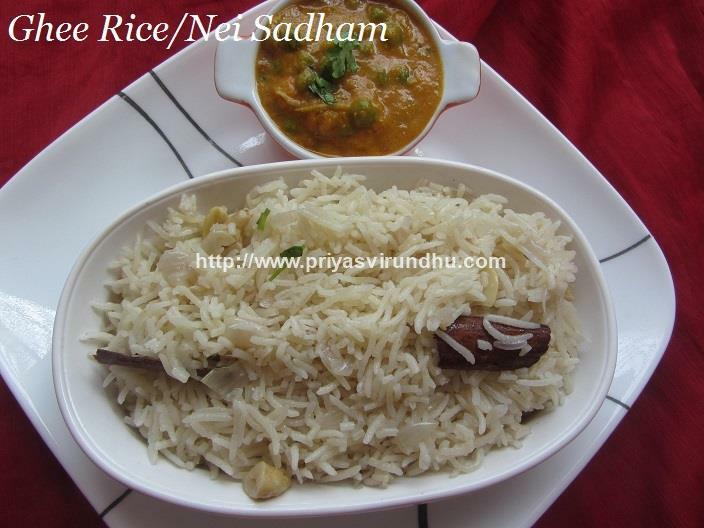 Lemon rice is a very simple and quick dish to prepare and comes in handy for lunch box. Not only just lunch box but also for travel, it does not get spoilt because of the lemon juice which acts as a natural preservative. Lemon rice is also prepared during special pooja days, Seemandhams and Valaikappus(Baby shower). In my earlier post I had mentioned about the valaikappus . In Valaikappu’s/Seemandham’s 5 or 7 or 9 different types of variety rice is prepared for the occasion and lemon rice plays a vital role in it. Check out my other Valaikappu Rice Varieties here, I will be updating all the rice varieties one by one in my future posts. Usually Lemon rice is prepared with Potato Masala/Fry but today I prepared Spinach Pakoras and served it as side dish. Hi everybody, here’s another simple, easy and healthy one pot meal. It is just a fabulous lunch box recipe that can be made easily in the morning rush. Here’s the quick tip, just grate the carrots the previous night, keep it in the refrigerator and go to bed. Any way guys enjoy this healthy one pot meal. Vegetable Biryani’s can be made in different ways, like layering, in rice cooker or vegetable dum biryani. 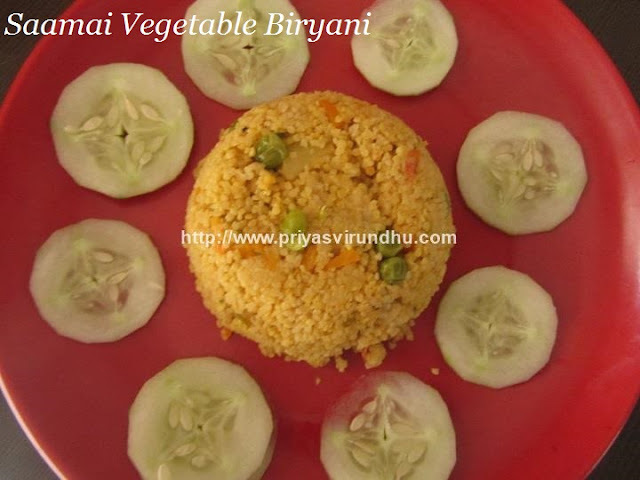 This is the easiest and simplest version of vegetable biryani made in no time. It is a perfect and healthy one pot meal for all types of occasions, and especially very useful when packing lunch for kids or your husbands. Since it was a vegetarian day and I was running out of all vegetables but had a big box of mushrooms so I thought I will make a mushroom pulav. But I was getting really bored to make a pulav, so decided to make biryani. I remember seeing mushroom biryani in sharmi’s space, but I made changes by grinding different ingredients and believe it or not it tasted like mutton biryani and made my day. Everybody in my house was happy and gobbled it up, so I am sharing it with you all. It is a great one pot meal perfect for parties and get-togethers. 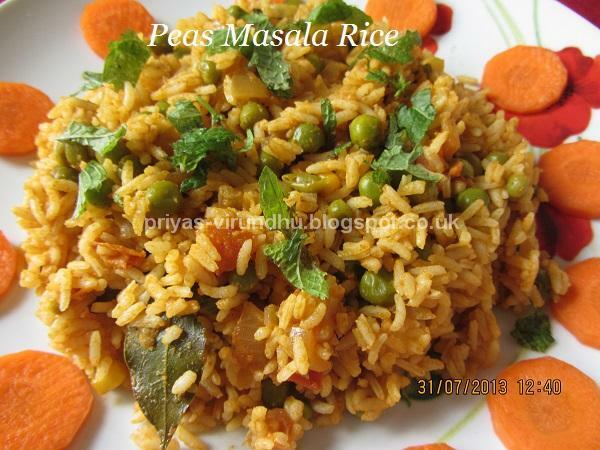 Peas pulav is a simple one pot meal hassle free and can be made very quickly. It is perfect for get together’s when you have lot of other dishes to make and is also best for packing as lunch. 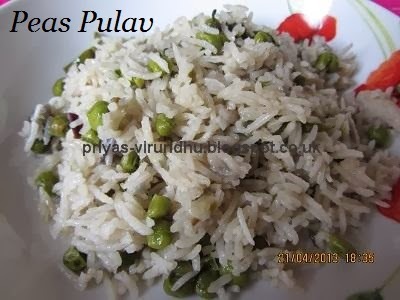 I have used coconut milk to make this peas pulav because my kids love it like that and it also gives extra flavor but you can as well replace it with just water. Check out my quick Vegetable Pulav Here.